We are developing new ways to alter the behavior of specific cell types in the body that regulate immune function, disease, and drug resistance, with the goal of improving clinical care of obesity, diabetes, and cancer. We use nanomaterials and targeted delivery together with companion diagnostics. Nanomaterials have already had success as clinical therapeutics, but their impact has been significantly hindered by low delivery efficiency. The problem is that upon injection to the blood, the vast majority of nanoparticles end up in the liver and spleen, which are often not the intended targets. 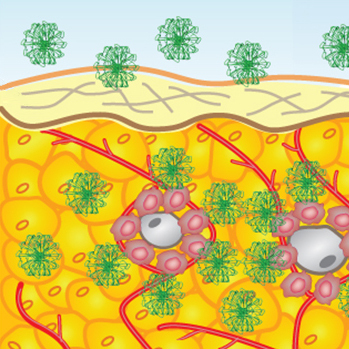 Furthermore, when nanoparticles enter cells,they become trapped in vesicles and are unable to reach cytoplasmic targets. Our lab is developing translational approaches to solve these problems by using multiscale imaging to inform insights into pharmaceutical science and physiology. This work is enabled through a multidisciplinary collaboration with Kelly Swanson (UIUC Animal and Nutritional Sciences), Wawosz Dobrucki (UIUC Bioengineering), and Erik Nelson (UIUC Molecular and Integrative Physiology) and supported by a grant from the NIH/NIDDK. We recently introduced a new approach to nanomaterial therapy for treating obesity through regional delivery of nanomaterials targeted to adipose tissue macrophages (ACS Nano, 10: 6952 2016). Macrophages induce local inflammation, the triggering event for type 2 diabetes and other comorbidities of obesity. We demonstrated that more than 63% of an injected dose of a nanoparticle drug could reach its target cell type in adipose tissue, an extraordinary delivery efficiency (usually <1% for tumors). We work exclusively with materials that are clinically translatable and approved for human administration. After delivery to adipose macrophages, materials containing therapeutic cargo induce a therapeutic effect to restore the inflammatory state to that of lean tissue. Our team is using transcriptomics to understand how nanoparticle drug delivery alters physiology in adipose tissue and distal tissues for a variety of pharmaceutical inhibitors toward eliminating type 2 diabetes and other comorbidities. Some of the rationale for this work and related drug design rules have recently been reviewed (Curr. Drug Targets, 16: 560, 2015; Ann. Rev. Phys. Chem., 66: 521; 2015, ACS Nano, 7: 9518, 2013).